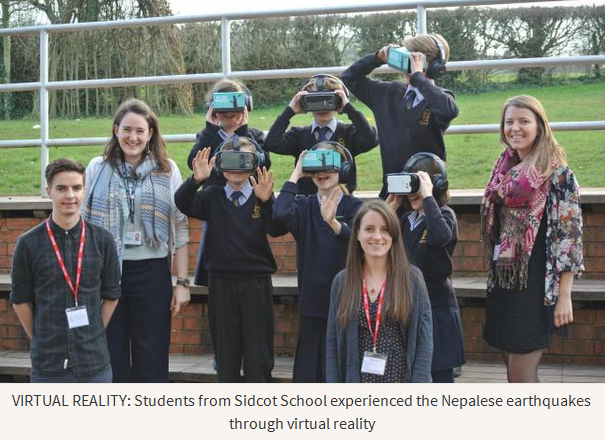 STUDENTS from Sidcot School got to experience the horrors of the Nepalese earthquakes through virtual reality technology. Representatives from WaterAid gave students the opportunity to relive the devastation of the Nepalese earthquakes, which killed 9,000 people and wiped out nearly half of all water supplies in 2015. Miriam Gosling, Director of Peace and Global Studies said: “Both students and adults who attended the evening sessions really reacted to their virtual experience. "Their imagination was sparked as the plight of local villagers was brought to life by the VR technology. "There was also a sense of hope that, with practical support and encouragement, they have been able to rebuild their lives and their village. "An inspiring demonstration that the human spirit is resilient enough to overcome dire adversity”. The international charity brought the plight of a Nepalese village to life through virtual reality headsets enabling students to virtually experience the struggle as villagers repair their water system and re-build their lives following the earthquakes. Students were shown a virtual reality film, Aftershock, which tells the story of Nepalese plumber Krishna Sunuwar, as he works with his neighbours to repair the water system damaged in the earthquakes leaving homes in ruins and the village’s water supply dried up. In the film Krishna Sunuwar said: “We had water overflowing after the first earthquake, but the second earthquake caused it to completely dry out. "Without water we can’t farm, we can’t irrigate, we can’t keep livestock. We had to drink dirty water. WaterAid, who work globally to transform millions of lives by improving access to safe water, sanitation and hygiene, was invited to the school as part of its ‘Let Your Life Speak’ programme. Sidcot School says the programme provides a platform for a diverse range of speakers to create a better understanding and to challenge conventional perception among its students and members of the public.